Last weekend I was in the mood to bake #allthethings…and so that’s exactly what I did! Saturday started with an early(!) morning 5K race with the family (where we all won!) and then I spent the rest of the day in the kitchen. We run together and then we eat together =). 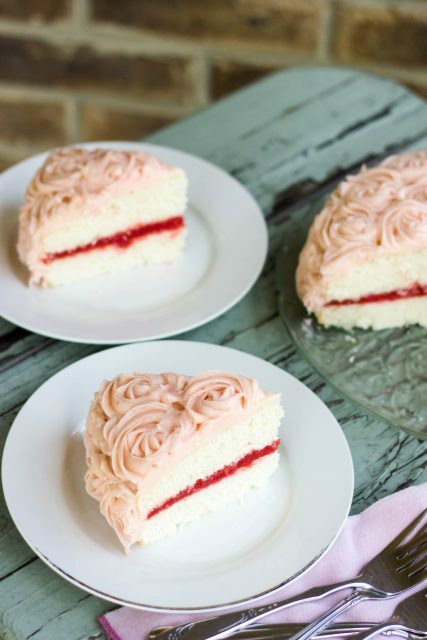 Last but not least the strawberry cream cheese frosting!! 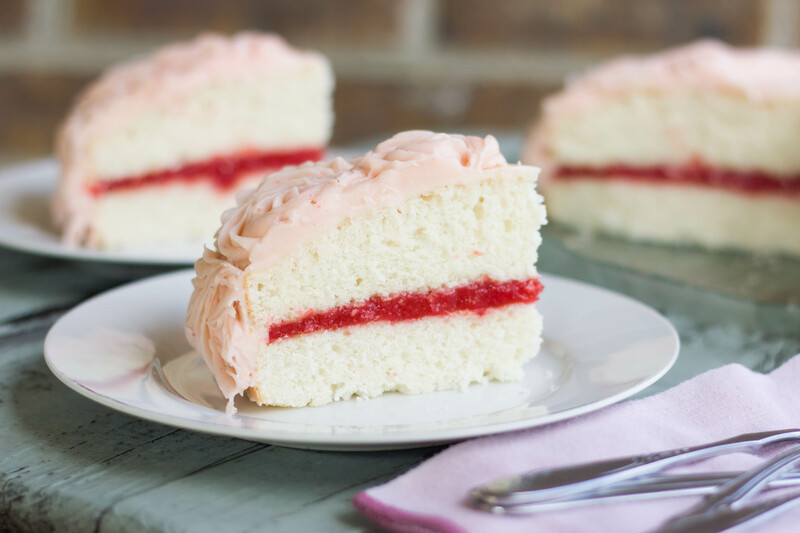 I added a couple tablespoons of the strawberry curd to the cream cheese frosting and it gave it a beautiful pink color and great strawberry flavor. The best part? It was still stiff enough to pipe! I’ve found the best way to keep cream cheese frosting pipeable is to use cold cream cheese and butter that’s somewhere between cold and room temperature. I know you’re going to love this cake. Give it a try. Enjoy! 1. To make the white cake, line the bottom of 2 (8-inch or 9-inch) round cake pans with parchment and spray with nonstick spray. 2. In a small bowl, combine the flour, baking powder and salt; whisk to blend and set aside. 3. In the bowl of an electric mixer fitted with the whisk attachment, whip the egg whites on medium speed until foamy. Increase speed to medium high and continue to beat until stiff peaks form. Transfer the egg whites to another bowl and set aside. 4. In the bowl of the electric mixer now fitted with the paddle attachment, combine the sugar and butter, and beat on medium-high speed until light and fluffy, 2-3 minutes. With the mixer on low speed, beat in half of the dry ingredients just until incorporated. Blend in the water, vanilla and almond extracts. Beat in the remaining dry ingredients just until incorporated. 5. With a silicone spatula, stir in about a quarter of the egg whites to lighten the batter. Gently fold in the remaining egg whites, until the batter is smooth and no streaks remain. 6. Preheat the oven to 350˚ F. Divide batter evenly among prepared pans and bake, rotating halfway through, until a toothpick inserted in the center comes out clean, about 15-18 minutes (depending on if you use 8 or 9 inch pans). Transfer to a wire rack and let cool in the pan for 5-10 minutes. Run a knife around the edges, then turn the cake out onto the rack and let cool completely. 1. Press strawberry puree through sieve to remove some of the seeds/pulp. 2. Combine all ingredients in medium sauce pan over medium heat. Whisk until thick. 3. Cover with plastic wrap (place plastic wrap directly on top of the filling to prevent a “skin” from forming). Cool completely and refrigerate until cold. 1. In bowl of stand mixer with paddle attachment, beat cream cheese and butter until smooth. Gradually add powdered sugar and beat until light and fluffy. 2. Add strawberry filling 1 tablespoon at a time until mixture is a spreadable consistency. 1. Place first layer of cake on desired serving platter. Top with 1/2-2/3 cup of strawberry filling and second layer of cake. 2. 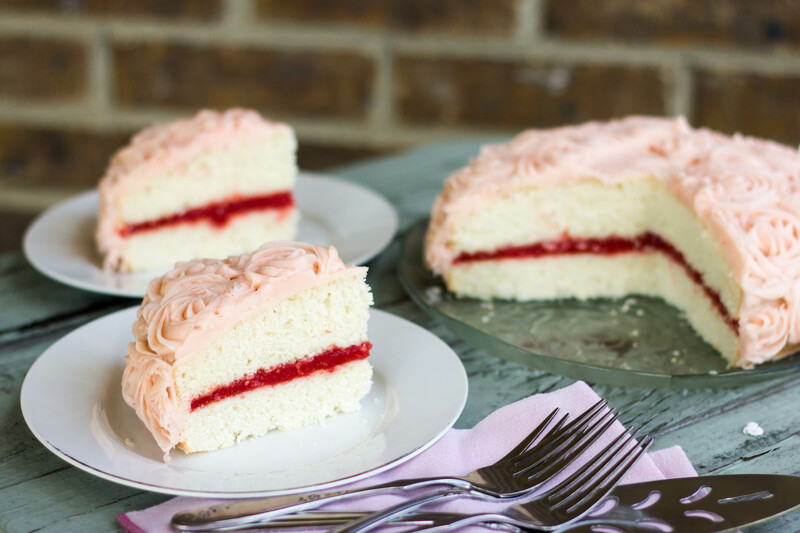 Frost top and sides with strawberry frosting – either with a knife or piping (tutorial HERE). Cover and store in refrigerator. Copyright © 2011-2019 Kendra's Treats - Tasty Treats from Kendra's Kitchen!